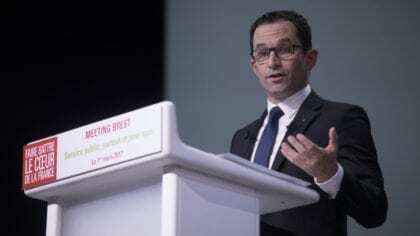 Benoît Hamon, French presidential candidate for the Socialist Party, was the subject of France 2’s political programme, l’Émission politique, on March 9. He here offered a revised version of his much discussed basic income proposal, which has been seen by many as backpedalling on earlier, more ambitious plans. Previously covered by Basic Income News here and here, the prior iterations of Hamon’s proposal involved the gradual introduction of basic income in steps. The first would provide a basic income without means testing for those between the ages of 18 and 25 (who are currently excluded from un- and underemployment benefits in France), while later steps would expand the non-means tested basic income to other segments of the population and increase its amount. BIEN’s French affiliate, the French Movement for Basic Income (MFRB), offers their analysis of this development. They explain that the first step of the new proposal would still be an improvement of the existing benefits system (the RSA) by automating its payment, increasing its amount to 600 euro/month and making it available to those between the ages of 18 and 25. Means testing would apply to all recipients under this revised proposal, however, such that only those receiving a net wage of less than 1.9 times the minimum wage (i.e., 2165 euro) would stand to benefit. The payment would then be on a sliding scale according to income – for each euro earned through work, the amount of the basic income would decrease by 28 cents. Hamon continued to defend the idea of basic income during the week, noting that, in pricing the benefit, “we have thought about it on the basis of gross financing, but the universal income also yields money.” Julia Cagé, Hamon’s economic adviser, made similar claims, arguing that, while the deficit may increase at the beginning of Hamon’s term to fund the basic income, it will quickly fall due to, among other factors, the positive effects of the basic income boosting the economy. The first round of the presidential election will take place on 23 April. If no candidate wins a majority at that point, the second round will take place on 7 May. Hamon is currently polling at fourth place and has lost some Socialist Party support to Emmanuel Macron, who split from that party and formed his own, En Marche!, towards the centre of the political spectrum. It is therefore perhaps unsurprising that Hamon would seek to make his proposals more palatable to such elements. “Revenu universel : le MFRB analyse la proposition de Benoît Hamon” [Universal income: the MFRB analyse Benoît Hamon’s proposal], Le Mouvement Francais pour le Revenu de Base, 14 March, 2017. Claire Rush, “Socialist candidate Hamon backtracks on universal basic income”, RFI, 10 March, 2017. Rémi Clément, “Comment Hamon justifie son revirement sur le revenu universel” [How Hamon justifies his turn-around on universal income], Challenges, 10 March, 2017. “Revenu universel. Benoît Hamon revoit sa copie” [Universal income. Benoît Hamon revises his copy], Ouest France, 7 March, 2017. Stanislas Jourdan, “FRANCE: Minister of Economy says he is open to basic income”, Basic Income News, 26 January, 2016. Guy Standing is so right about how it won’t happen unless we demand it. Benoit Hamon is supposed to be the most progressive in France.